Capital of an influential medieval republic, struck by a terrible earthquake that destructed the city and decimated its population in the 14th century. Today, it is a sun drenched town featuring a small beach and sunny piazzas. 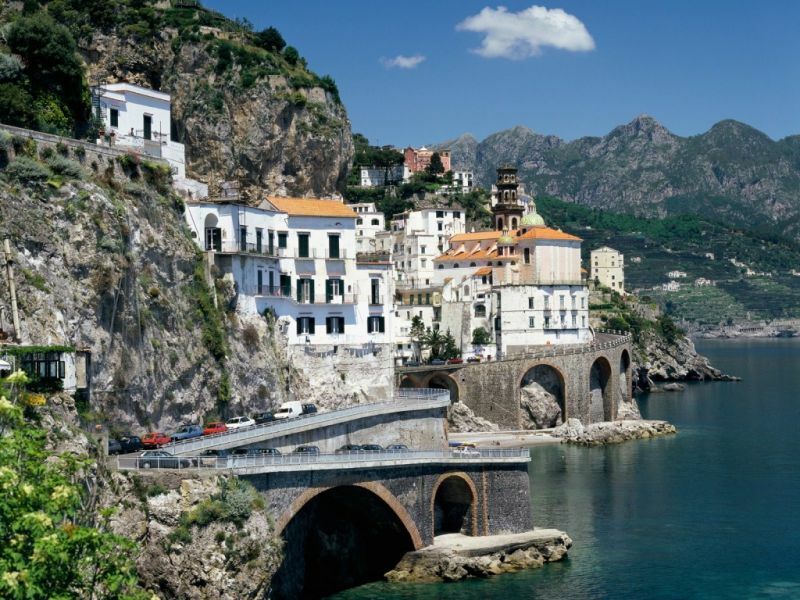 The lure of Amalfi is the sight of the Piazza del Duomo, its cathedral, shopping on the Via Lorenzo d’Amalfi, its thoroughfare, and relaxing and feasting in a trattoria by the stunning sight of the sea. Piazza del Doumo is watched over by the Cattedrale di Sant’Andrea, a pastiche of styles. Built in the 10th century, it comprises of Sicilian and Arab-Norman masonry, the bell tower dating back to the 1200s, enormous Syrian bronze doors, baroque interior and mosaics dating back to the 1200s-1300s. By the cathedral are the Cloisters of Paradise, constructed in the 13th century for the great citizens of the town to be buried in them. The Arabic arches area is based on marble columns which surround a garden. From here, there is access to the Basilica del Crocefisso, with its collection of religious artefacts and frescoes from the 1300s. The crypt underneath the basilica has Sant’Andrea’s body. The Museo Civico is a tiny museum featuring the Tavole Amalfitane, a draft of the maritime code, and priceless documents. The most antique European paper mill is occupied by the Museo della Carta keeping the original paper presses which can still operate. Arsenale, where, at the time of the Maritime Republic of Amalfi, ships were built, plays host to exhibitions. The only beach of Amalfi is the coarse sand Spiaggia Grande of 150 m approximately. You can also head for the bathing facilities close to Corso delle Repubbliche Marinare or hire a boat along Lugomare dei Cavalieri and find a bathing spot along the coast. 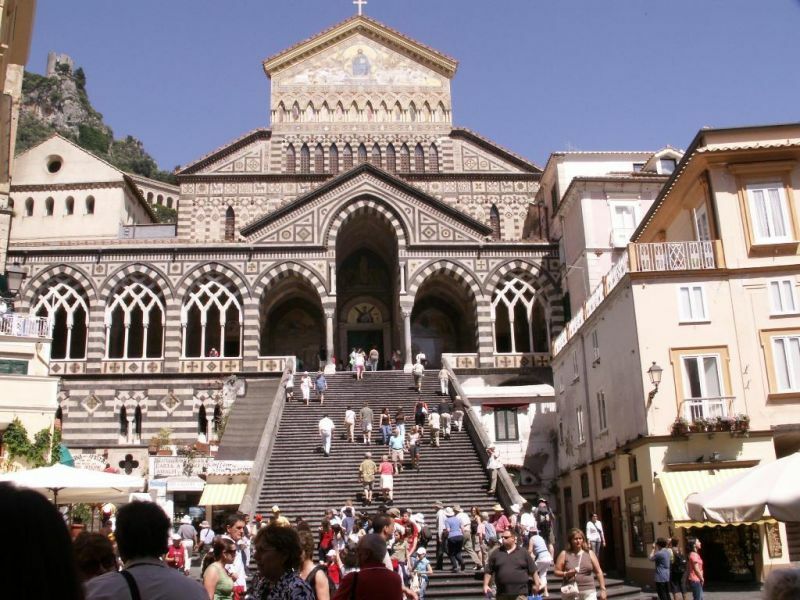 For shopping or taking some souvenirs home, head for Via Lorenzo d’Amalfi where shops overflow with ceramics, limoncello and paper made gifts. You will find products ranging from ham, cheese, coffee, and scented soaps at Anastasio Nicola Sas. Paper products and related elements such as albums and notebooks are at L’Arco Antico (Via Capuano). Eateries are focused on tourists and food and are almost always good quality. They generally serve pasta, grilled meat, seafood and wood-fired pizza. For a refreshing lemon granite try A Sciula (Via Fra Gerardo). It also sells excellent smoothies, yoghurts and fruit salads. Trattoria Il Teatro (Via Herculano Marini) serves seafood, grilled meat. Vegetarians may be happy with the offers there. You can dine on the terrace or in its enormous dining hall. At La Pansa (Piazza del Duomo) you are tempted with cornettos, cappuccino, cakes and pastries. It is a gift from the gods. Maccus (Largo Smaria maggiore) has no fixed menu but it surpasses the others. Elegance, good cuisine and a fine setting define it. Pizzeria Da Maria (Via Lorenzo d’Amalfi) lures tourists with its delicious pizzas, good pastas and main courses. Porto Salvo (Via Supportico Marina Piccolo) is for those who need a refreshing ice cream or a quick snack such as pizza, panini or deep-fried dough balls. Ristorante La Caravella (Via Matteo Camera) serves regional dishes with an innovative touch. Its wine cellar is fully stocked. Trattoria Da Baracca focuses on fish dishes and its atmosphere of maritime decoration and friendly staff make it very inviting. Trattoria Il Mulino (Via delle Cartiere) offers a family atmosphere, generous portions of food and affordable prices. Trattoria San Giuseppe (Salita Ruggiero II) is reputedly the best pizza maker in Amalfi. Toppings are plenty and pasta comes in generous portions. 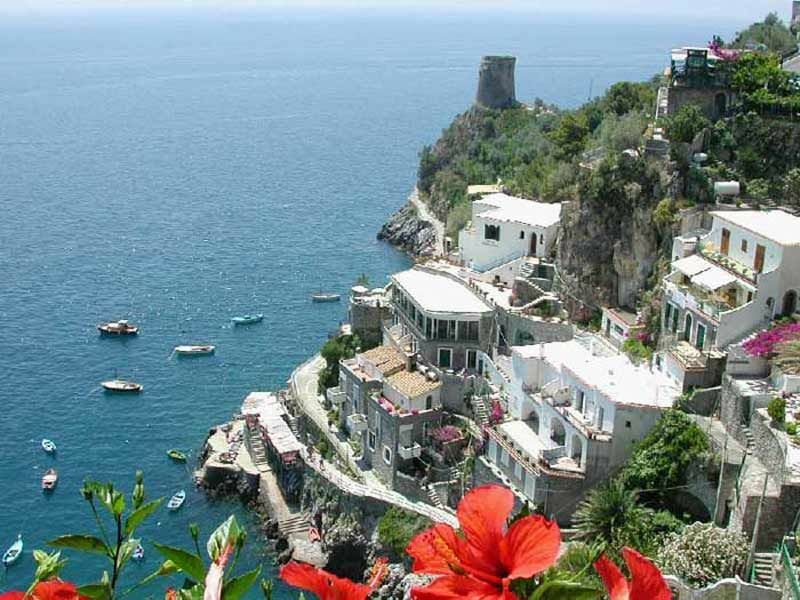 BY BOAT: to/from Salerno(services: 7 a day), Ischia (services: 1 a day), Capri (services: 2 a day), Maiori and Minori (services: 8 a day), Positano (services: 7 a day), Naples (services: 4 a day), Sorrento (services: 3 a day). BY BUS: to Sorrento leaving from Piazza Flavio Gioia(1 ½ hours, services more than 12 a day), to Ravello (length: 25 minutes, services: every 40 minutes), to Salerno (length: 1 ¼ hours, services: every hour), to Naples (length: 2-3 hours, services: 7 a day). Timetables are at Bar Il Giardino delle Palme (Piazza Flavio Gioia). BY CAR: coming from the north along the A3, take the exit at Vietri sul Mare, then drive along the SS163. coming from the south, leave the A3 at Salerno, drive to Vietri sul Mare, then take the SS163.